Talking about the remains of Paleolithic and Neolithic era, the same historian writes: "The place that we now call Central Albania and Macedonia was also the richest and most powerful (he means prehistoric times) centre of culture. Recent most important center analogous to that prehistoric center, near Lake Maliq (in Albania), is the Aromanian town, called Moscopole ''(3). As we are referring to prehistoric times and even to Paleolithic and Neolithic period, I would like to inform you that this September in a hotel in village Smixi the ‘Association of people from village Avdella, (called) Vassilitsa’ and ‘Pan-Hellenic Federation of Aromanian Cultural Associations’ organized a scientific congress, entitled ‘Vlach villages of Mount Pindos, especially those in Grevena’. One of the lectures, Mr. Nikolaos Efstratios, professor of archaeology in Aristotle University of Thessaloniki, presented a theme relevant to his excavations in the area of village Samarina. He found there stone tools of prehistoric hunters, as well as traces of the first residents of Europe, Neanderthals. As Mr. Efstratios said, village Samarina and mount Pindos in general, is the only mountain chain all over Europe, where traces of presence of the primitive Neanderthal (man) were found in such high altitude. As we leave the Stone Age of Pindos, we go to the Gold Age of Macedonia, associatively. Here, before the emergence and dominance of Macedonians, mythic Midas, king of Phrygians (local people), had the reputation of a very rich ruler. Indeed, an English geologist, after fieldwork, wrote that, in prehistoric Macedonia, surface vein of gold ran from Mount Pieria and reached up village Avdella (Pindos). So later, the development of goldsmiths art of Macedonians was supported on the experience of gold processing of Phrygians. This is proved not only by the findings of the tombs of Vergina, but especially by those found in village Sindos near Thessaloniki; they are older than Vergina ones and are crafted with more joinery processing. They are unique works of goldsmith craftsmanship worldwide. Also Academic Antonios Keramopoullos, decades before the discovery of the above gold masterpieces, based on other gold archaeological findings from the place of Northern Macedonia, connected timelessly the performance of Aromanian/Vlachs in goldsmith art with that one of ancient Macedonians; Vlachs from Kalarites (village), Metsovo, Moschopole, Nymfeon (village) etc showed up unique craftsmen in the artistic processing of both gold and silver. I heard myself wise university teacher, Nikos Moutsopoulos, saying relevant things: “I come - he said - from a mountain village of Messinia-Arkadia (from The Peloponnese). Silversmith art was keenly practiced there. So when my curiosity made me try to find out where this art had come from, I could not find elsewhere except from the well known traditional Vlach villages, which brought up great craftsmen, like Giorgos Diamantis Bafas, Thanasis Tsimouris, Sotiris Bulgaris and others”. According to his opinion “people, especially from ‘Kalarites’ (Aromanian/Vlach village) were the best silversmiths in the world”. I also believe that the motifs of Vlach folk art (especially weaving) are associated timelessly with the ones of the ancient Greek classical art and those ones of later Hellenistic and Greek-Roman period. So, fabric designs-patterns are found in very old vlach pillows, such as the Double Ax, the dragon-shaped river-god Achelous and the Caduceus of Hermes. The last two-snake-shaped Achelous and Caduceus of Hermes- as far as I have researched, do not exist in textile-weaving folk art of the rest Greek people. We find a dragon-shaped pattern with twelve wings of Achelous in Metsovo, where people call this strict geometric plan ‘arpile alu Aspropotamu’ (in Aromanian idiom) "Wings of Aspropotamus". As far as the Caduceus of Hermes concerned (with a lot of shapes), one can find it in the most woven fabrics of local art of Vlachs. A linear detail, that symbolizes the concept of fertility, appears everywhere. We can also see the same type of caduceus in ancient vases, while I, personally, located it (caduceus) in a funerary relief column with Hermes (the conductor of souls) in the Archaeological Museum of Veria (4). Regarding the double ax, the ancient Double Ax, this is the most frequent pattern of textiles (woven fabrics) of Aromanians/Vlachs, before the final predominance of textiles with large colored flowers that displaced (replaced) ancient symbols forever. I could also mention other elements of Aromanians’/Vlachs’ folk life such as - for example - the folk-religious Tranos (big) Dance (corlu ali hoarî), the costume and the songs; Takis Papahatzis wrote about them and he especially dated them back to ancient Greek standards (5). The Macedonians’ Star (Sun) was not absent from Aromanians’ culture, too. As we see the eight-rays Sun (star) of ancient Macedonia embroidered in the traditional fez (hat) of the women traditional costume of Naussa (town in Macedonia), the same way I, personally, saw (in a painting) the similar star on a fez (hat) of an old man from Metsovo. This particular painting was made four or five years before Andronicus’ discoveries in Vergina (the date was written on the painting). Women from Fourka (Aromanian village in Epirus) embroidered eight-rays star on their bust (dress). The Star (Sun) of Macedonians first appeared in ancient city, Levea of Upper Macedonia, which Nicolas Hammond featured ‘prehistoric Samarina’, as it was a mountainous and livestock village. According again to Hammond, Samuel Baud-Bovi, a famous Swiss musicologist, recorded a musical melody in Metsovo (the center of folk culture of Vlachs), the rhythm of which-he found out- was the same one with a Doric paean (song of triumph) of an ancient inscription of God Apollo in Delphi (ancient oracle). The memory of old Vlach people has preserved evidence of the ancient-greek heritage, in the field of mythology, too. Thus, Alexander the Great is represented in a myth from Metsovo as a ram (male sheep) at daylight and as a handsome young man at night, an element related to Alexander as the son of Ammon Zeus, the highest god with ram horns; it should be noted that Alexander the Great was illustrated with ram horns on the coins (currencies) of the Hellenistic era. The ‘ears’ that Aromanians from Gramousta (village in Pindos) sewed on the shoulders of their capes, is an alive symbol a few generations ago. This sewing element reminds us the ears of a goat. That’s why rest Vlachs use the nick name ‘Tshipi’ i.e ‘Goats’ for Vlachs from Gramousta (they call ‘Cipa’ the goat with small erect ears). The goat, or ‘aiga’ in Crete, was totemic/ancestral animal for ancient Macedonians. It was also an ‘ancestral’ animal, because Karanus, their mythic founder, following the goats from the headwaters of River Aliakmon (its starting point is in village Gramousta), arrived and stopped on the right bank of this river, in the location of modern Vergina, where he built ‘Aigai’, the capital of his kingdom. It must be noted that the type of headband in the traditional costume of women from Gramousta and that one of women from Kalash, descendants of Alexander the Great's soldiers in NW Pakistan, show many similarities. 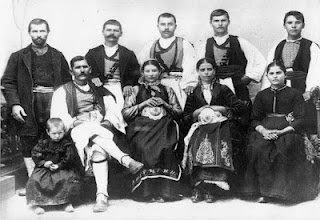 Having the above cultural elements in mind, it could be argued-very reasonably- that Aromanians/Vlachs, contain inherited elements of Greek-ancient past in their ethno-folklore core. After popular/folk culture reference, we ‘pass’ now to the evidence of historical sources, from which we are informed of the timeless presence of Aromanians/Vlachs in the place of their ancestors. As we are informed by ‘Father’ of history, Herodotus, old Macedonians ‘reached manhood’ in the area of Pindos. Their kingdom was permanently exposed to predatory invasions of Illyrians, Triballians and Gauls, later. This forced them first to organize well their defence. However, defense requires, in advance, fortified positions and skilled people, ready to fight and encounter enemy at any time. This way, Macedonia became the big defensive mound for southern Greeks, who, thanks to Macedonians, found the time, being secure from north and undistructed, to develop culture and conduct their long destructive civil wars. Romans knew well the defensive value of Macedonia for the protection of southern Greece. Therefore, after their first victory against Macedonians in ‘Kinos Kefalae’ of Thessaly in 197 BC, imposed the term to the defeated (Macedonians) to dissolve their fleet but not their army. This was because, if Macedonian army was dissolved, a defensive gap would be created, in front of the continuous invasions of barbarian tribes at that time. This happened (no dissolution of Macedonian army) because Romans didn’t still want themselves to raise the undesirable and expensive burden of defence against northern enemies. Certainly their aim was to dominate South Greece. However, after the defeat of Macedonians in the Battle of Pydna-today Kitros of Pieria- in 168 BC and the inevitable dissolution of their army, the country appeared exposed and undefended against the enemies from north. Macedonians then asked from General of Romans, Aemilius Paullus, to establish guards in dangerous border passages, and he, according to historian Titus Livius (45.29), «regionibus quae adfines barbaris essent (excepta tertia omnes errant), permissit ut praesidia armata haberent, ie. «General permitted to the countries bordering the barbarians (except the third Macedonian territory, all the rest bordered to barbarians), to have armed guards». THESE are the first ‘Armati’ of the Roman period (in Macedonia), the first armed guards and later so called ‘Αρματολοί’ (greek word). At this point I open parenthesis to comment on the word αρματολός «armatolos» of modern Greek. Colleague linguists (I am a linguist) support that the word ‘αρματολός’ is produced by the wοrds ‘άρματα’ (means ‘arms’) and ‘αμαρτωλός’ (means ‘sinny’) with ‘mixture’ or ‘intermigling’, as the say (linguistic term), while others (linguists) believe that it is produced by the word αρματολόγος «armatologos», like αρχαιολόγος «archaeologist», καρδιολόγος «cardiologist». So, αρματολόγος> αρματολόος>αρματολός. These linguists ignore or pretend to ignore that the origin of the word αρματολός comes from the status/ordinance of the above mentioned ‘armed guards’, a status that was introduced immediately after the Roman conquest of Macedonia. They also ignore that these armed guards, the users of the Latin linguistic idiom and early Vlachs, used the word “armatu’ (for ‘armed’ men), which is past participle of the verb ‘armare=arm, bear arm’ plus the article -lu at the end of the word becomes ‘armatulu’. Greek language then, received this word along with the article as αρματουλός «armatoulos» or more clearly αρματωλός «armatolos» and gave it back to Aromanian linguistic idiom (reborrowing), so we have the Aromanian word ‘ar(a)matulolu’. Besides, the word Αρματωλοί «Armatoli» (Greek word for mountainous armed people in the past) appears in places of Vlachophone Greek people or near them, while this word is nowadays still used for the guard of Vlach villages that are deserted during winter. Historian Diodorus (31.8.9) also repeats the above Titus Livius’ information, writing: Romans ‘installed, ie, settled soldiers’. Certainly these armed Macedonians were included in the Roman military structure. As we shall see, they also undertook later a larger role than that one of local guards, reaching the role of personal guards of the emperors, as Praetorians. We have to note that the Praetorian body came from people from Italy or from provinces (linguistically enlatinized). “Eordea, Lynkestia and Pelagony people inhabit the fourth region. Atintania, Tymfais and Elimiotis people are attached to them. This whole country (Western Macedonia) is cold, rough and difficult in land cultivation and its human customs (morals) are similar to this type of land, too. Their barbarian neighbours make them more savage, sometimes practicing them in war and other times mixing morals each other in peace time”. I quoted the above text as indicatory of the character of these people and the nature of their country, which was the cradle of the most compact latinophone population in southern Balkans. “Romans created Fourth Tetrarchy in reference to the services of the past, but mainly with the objective of military defense, since they installed soldiers at external borders”. For the defense of the west war front of Tetrarchy, Rome occupied (creating military installations) prominent locations north Lake Ohrid, where later Via Egnatia was carved. At the time of geographer Strabo (early 1st century AD), Roman provinces were divided into Imperial provinces and into provinces of Roman people, ie, those provinces where there was no enlistment of soldiers, but there was tax payment. According to Strabo (17.3.25), Imperial Province was declared any one that needed military guard. Such provinces (imperial) were underdeveloped areas, bordering to rebellious populations, or places with poor crops and poor in general, whose residents by reason of poverty tended to robbery and disobedience, while provinces of Roman people were those that needed no guard and were easy to command. Then, ancient geographer Strabo lists the provinces, from which recruitment (military enlistment) was performed. Sixth and Fifth Legions came South Illyria, North Epirus and West Macedonia, while Seventh Legion came from Achaia, Thessaly, Aetolia, Acarnania and the East Epirus. As Cassius Dio (LV.23, Roman historian) writes two centuries later, the soldiers of Fifth Legion came precisely from Fifth strategical Province and they had the oversight of Dacia (today Romania). Let’s remember that Dacia was submitted to Romans above 280 years after the subjection of Macedonia. This time difference of about three centuries, from the conquest of Macedonia until the conquest of Dacia, allows us to think and wonder: Who spoke first Latin language, Western Macedonians or the ancestors of Romanians (people of today Romania)? Macedonia became the military base of Romans and the starting point of their warfare for the conquer of the inland of the Balkans. Thus, Romans with mountainous Macedonians and mountainous Spaniards, as well as with the famous Legions of Tarragonia (Lat: legiones tarraconenses), crushed the strong resistance of the also mountainous Dacians. Since then Macedonians have been guarding Dacians, the ancestors of modern Romanians. Cassius Dio at this point, as we have seen, is very clear when he says: “Fifth Macedonian in Dacia”. Macedonians have been guarding Dacians for 150 years, until Emperor Avrilianos in 272 AD, forced by the successive attacks of barbaric German tribes, ordered the roman administration and army to move to the south bank of the Danube. From then until the time of Emperor Justinian and a little later, professional soldiers from Western Macedonia, “Tsintsari’ ie ‘Greek: Πεμπταίοι = soldiers of Fifth Legion’ (‘tsintsi’ is number 5 in Aromanian idiom), had undertook to guard the area from Beograd and Vidin of northwest Bulgaria to the Danube and Nis (southeast of Serbia); Nis is the birthplace of Constantine the Great. 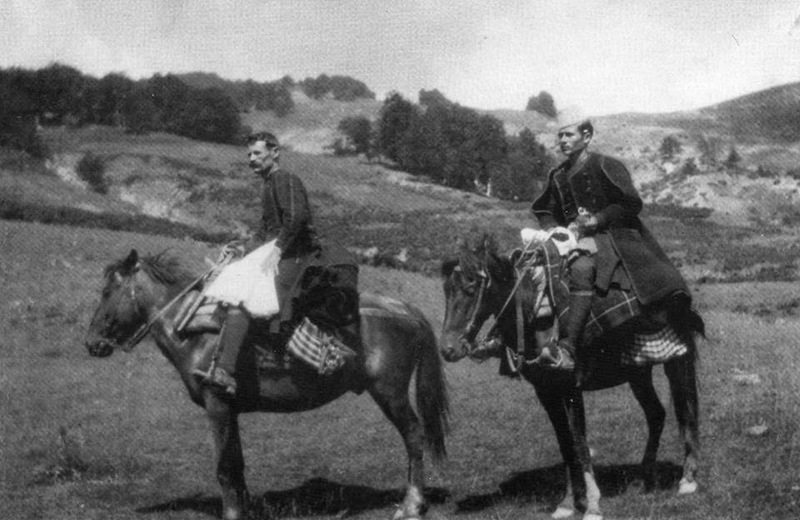 Macedonian Veterans were allowed to return to their ancestral homes and were offered ‘imperial’ lands, while younger continued to guard northwest Balkans; even now Serb people use the word ‘Tsintsari’ for Aromanians/Vlachs. The linguistic affinity between the new Latin idioms of Romanians and those ones of Aromanians also came of these comings and goings of Macedonian soldiers from Dacia to riparian Dacia- in Latin language: ‘Dacia Ripensis’- (both banks of the River Danube). We should note that, according to linguistic research, both roman idioms of Pindos and Romania come from South Italy; these idioms necessarily were passing by south Balkans, ie the ‘Via Egnatia’ towards north Balkans. Romans considered Macedonians as the only (of all conquered people) equal to them, while Western Macedonia had been declared (by them) ‘Macedonia Libera’ (free Macedonia), an allied and not vassal place. This privilege allowed its people to participate in the army and in the administration of the vast Roman Empire. All the above are confirmed by John the Lydian-Buzantine administrator and writer-(7). In his well known written testimony, he informs us that, in his time (6th century AD, Justine’s time) the inhabitants of Europe (the Balkans were called Europe at that time), although most of them were Greek in origin, spoke Vulgar Latin. He also writes that those who served in Roman public - he calls them ‘δημοσιεύοντας’, civil servants- spoke it in their domestic life, too. It had become - in other words - their mother tongue. John the Lydian, chief administrative officer of Byzantium and contemporary with what he wrote, is the most clear and reliable historical source for the Aromanians’ greekness and their latinophony. Also, a century before John’s (the Lydian) testimony, historian Priscus (8), exactly in 449 AD, making a description of the prisoners in Attila’s Court, writes that, those who came from Balkan inland, communicated only in Latin, while those, who were captured from coastal areas, spoke both Greek and Latin. There are more historical sources that make references to Aromanians/Vlachs of Middle Age, too. However, the need to save time in our speech requires ‘passing’ to the religious terms of the Aromanian/Vlach language; we will present them as elements only with value of historical information. Aromanians (‘Armani’) were residents of Northwest Greek places around major roads, the ‘Via Egnatia’ of Romans and they called it ‘Calea tseá Marea’, and the ‘Royal Route of Philip II of Macedon’, which passed through the place ‘Tshourgiaka’, south of the Aromanian village Samarina and led to the interior of Pindos; they called it ‘Vlachostrata’ (Vlach road). These people had direct contact not only with muleteers, merchants, soldiers and travellers, but also with uneasy in spirit people, who traded new for their time ideas, such as the preachers of Christianity. I remind you Paul the Apostle, who was travelling through Via Egnatia to communicate love message of Christ in Macedonia. Early Aromanians/Vlachs got words from latin language from first Christian centuries to express themselves in their religious worship. For example: ‘crutse’ «cross» from the latin word ‘crux-cis’, ‘tseară’ «candle» from the latin word ‘cera’, ‘Stă Măria’ «Mother of God» from the latin word ‘Sancta Maria’, ‘sâmtu’ «saint» from the latin word ‘sanctus’. So we have: ‘Sân Medru’ «Saint Demetrios», ‘sân Kedru’ «Saint Peter» etc., ‘mi cumînicu’ «communicate Eucharist» and others (9). I think that the above words of latin origin came in the religious terminology of Aromanian/vlach language in the early centuries of Christianity, because the linguistic contact of the Balkans with the Latin Cathedral, Old Rome, stopped definitively in 476 AD, when German Goths conquered it (Rome), disorganizing Western Roman Empire forever. These words of latin origin also testify the early attendance of Aromanians-Vlachs in Christian faith, which had originally won urban centres and a large part of the Roman army. Constantine the Great also diagnosed early the growing dynamic tendency to religious faith and decided to turn the wheel of history to the new direction, Christianity. Constantine the Great, although he was an ambitious person, who worked for posterity (fame after death), did not allow people to call him ‘Domine Deus’ «Lord God», as people used previously to address to the (each time regarded as God) Roman Emperor. So, after the establishment of Christian faith, the word ‘Dominedeus’ was adjusted in Aromanian language to ‘Dumnidzău’ and it declares ‘Heavenly God and Father’ now. Both first-medieval Aromanians/Vlachs and Greek-speaking inhabitants of the Eastern Roman Empire, Byzantium, were Roman citizens. Besides, it should be noted that people used for Byzantium the words ‘Ρωμανία’ «Romania» or ‘Αρμανία’ «Armania». They also kept in their new religion (Christianity) worship elements of their older life, elements that enriched Orthodoxy. Thus, latin word ‘flammula’ - fist meaning «small flame»- later took the metaphorical meaning ‘red flag of the army’, while with the Aromanian words ‘flámură’ and ‘flámbură’ and Greek word «φλάμπουρο» passed in folk-religious customs (for example, marriage customs). We can locate (see) ‘φλάμπουρο’ «flampouro» in customs to places from Hungary, Romania until West Crete. The same also happens to the religious banners (flags) of Orthodox worship, which came from ‘vexilla’, the flags of Roman army. Another aspect of Orthodox worship is ‘Lamentation’ or simply Epitaph (in Easter days), which preserves elements of mourning for Adonis’ death and resurrection, god of nature (every spring with flowers gathering). I wrote down the best and most complete, in my opinion, funerary tradition in the aromanian/vlach village, Fourka, next to town Konitsa. Here, among other ancient-way details, Dorian invocation MA DA ie. «Mother Earth» and ‘Adunî’ «Adonis» are heard, while, in weeping, the word ‘maatrone’ is also heard; ‘μάατρον’ in the Doric dialect of Laconia (in the Peloponnese) means «baby» (10). This custom was secretly celebrated on Good Friday by six little girls and one little boy, all less than 12 years, in a distant place of Fourka. 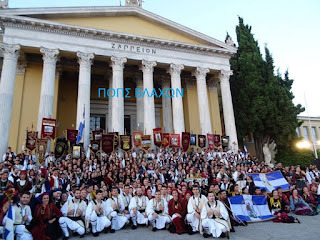 Don’t forget that we are always talking about Greek ancient custom origins and traditions of Aromanians/Vlachs. Recent daily life of Aromanians-Vlachs gives us the same picture like older times, the picture of men (always in cooperation with women) dealing with pasturing sheep and goats, cheese making, muleteering (Gr: κιρατζήδες), wool craft-processing, woodworking, saddlery (saddle makers), trade (commerce) and others. We do not know, but we can imagine, on the basis of the above evidence, the ethno folklore wealth, which Greek Aromanian maintained in centuries of ultimate time, when traditions were alive but nobody showed willingness to write them down. Historian and academician, Nikos Veis, who researched the region of Thessaly, tells us the same things; he also ascertained that, after his contact with vlach folk art, the data elements of this particular art lead us to ancient times (11). Historical sources, ethnic folklore and religious terminology - and not these only - make up the ‘constellation/galaxy’ of valuable Aromanian heritage. Greek-Roman world and culture owe much to Aromanians/Vlachs, who, in their Balkan dimension-as ‘populus armatus’ or otherwise as ‘cives armati’, ie «armed citizens», relocated the capital of the Roman Empire from Italy to the ‘edge’ of Europe, Bosphorus (boundary between Europe and Asia), there where Byzantium of old people from Megara (South Greece) was transformed into New Rome, Constantine’s the Great city (Constantinople). Here in ‘second’ Rome, Greek culture/education, Roman law/administration and Love message from Jerusalem altogether converged into fruitful synthesis, which made up Byzantine civilization (of one thousand years). 1. Macedonia. I, p. 420. 2. Macedonia. I, p. 79. 3. Macedonia. I, p. 232. 4. ‘Εθνογλωσσολογικά Ανάλεκτα’ «Ethnolinguistc Analects», by Anthony Bousboukis p. 216. 5. O Problemă de romanitate sudilirică. 6. Macedonia. I, p. 76. 7. ‘Περί των αρχών της Ρωμαίων Πολιτείας’ «About principles of the State of Romans”, III. 68.261. 8. Priscus, p. 190, ed. Bonn. 9. ‘Σημασιολογικές μεταβολές απ’ τα λατινικά σε βλάχικα και ιταλικά ιδιώματα’ «Semantic changes from Latin to Vlach and Italian idioms», by Anthony Bousboukis, p. 174-191. 10. ‘Εθνογλωσσολογικά Ανάλεκτα’ «Ethnolinguistc Analects», by Anthony Bousboukis,p. 82. 11. ‘Eleftheroudaki Encyclopedia’, entry ‘Vlachs’.